In 1978-77, I was studying in the Principia College, Alton, Illinois, USA. During a working lunch, I was asked to speak on the topic of Indian way of life. The students and faculty were amused when I told them that “Arranged Marriages in India” was my topic. I asked them if they would be interested in knowing the mechanics how most of the marriage in India were arranged. They were unanimous and felt that would be enjoyable to know and subject was lively. It was hard to accept for gathered crowd that such a system existed. They were unable to understand as to how it worked. Nearly all were shaking their heads and laughing at the whole concept. They were curious to know how the system was still prevalent. I told them that We can start with middle income group, which is more prominent. In India the girl is legally permitted to marry after she is aged 18 years & boy at 21. However, the girl should preferably be in her early twenties or just about graduated. The boy should be well settled with a decent income to run a home. The parents start looking for the match with the following criteria.1) Religion 2) Caste 3) Education 4) Income.5)Looks( Height, built, health and the complexion) and usually a horoscope. 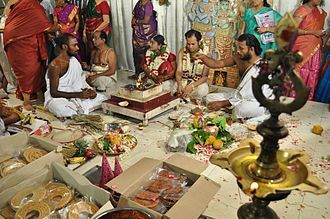 Amongst Hindus, they tally the traits and character of the both partners which could run well to 36 virtues, merits and qualities. Of these merits following are to be matched for the selection. You may call this process of : date and mate selection in the west. In addition to above five parameters we may add.1) Life style. 2 Cooking skills of the girl 3) Age difference 4) Nature of educational qualifications 5) Hobbies, Interests and tastes in arts like music and painting 6. Food habits Vegetarian and other food preferences. 7. Economic similarities of both the families. 8) Career background 9)Political leaning. 10. Musical tastes 11. Life goals and aims. If most of the parameters are met the proceeding take place. There could be a ‘Matchmaker’ who is the go in between. Every event is to be off record till a decision for engagement is reached. Both the families plan a get together for the “Look at each other.” Formal meet which is to be held at a convenient place which could be the lawns of a temple, or sometimes in hotel or at the girls home.At the same time, the boy and girl may be asked to meet separately in the adjoining independent place for getting to know each other for a short duration. The photographs of the boy and girl are exchanged in case all goes well. The families part and convey each other of meeting later for the formal answer. It is understood that photographs are to returned if the parties are not satisfied through the ‘Matchmaker’. In case the there is no matchmaker a popular newspaper of the area is used for the proposals by giving details of either boy or the girl under the column ‘ Matrimonial giving all requirements of other side by giving their own specification in the advertisement.